What better way to start 2017 with the thing you always wondered if it might be for you? 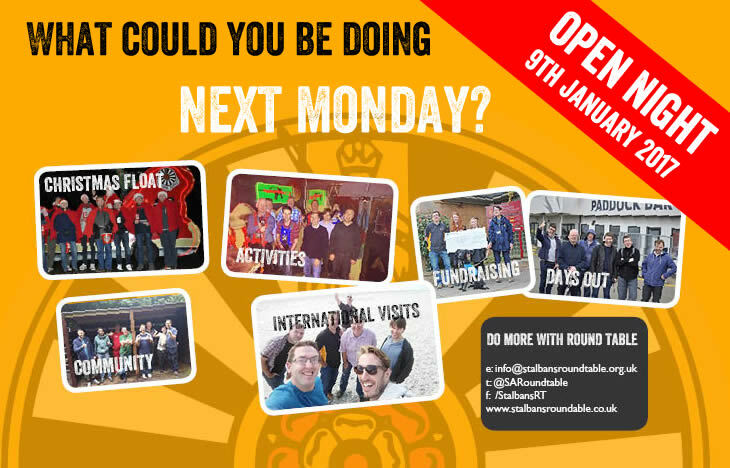 We are holding an open night for anyone to come along and find out more about Round Table. You saw us at the Farmers Market? You saw us come round on the Christmas Float? Maybe you spoke to some of us at the station collection? Maybe you heard about us before but always wondered? Join us at our open night! Well, here is your chance to find out more during our open night on the 9th January 2017 from 7:30 in the Old Fighting Cox. Grab a drink with us and have a chat with the members and see if you too could also be part of the Round Table family in the UK and the rest of the world! If you are thinking of coming to the open night we’d really like it if you could let us know by submitting the form below.